Add 27years of experience as an artist to a Bachelors of Science Degree in Business Management and you will discover why Yolanda D'Oyen delivers a creative approach to business development. 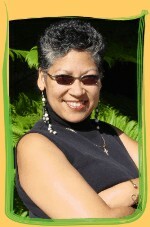 The Jamaican Artist/Designer, was born and blessed with the talent to design and express herself in the creative arena. Her desire to cultivate her God-given talents led her on a path of self-discipline and study. Attending some of the finest art, design and business schools in Jamaica and the US, including The Jamaica School of Art, The Art Center College of Design and Azusa Pacific University in California, D'Oyen was able to further expand her gifts in a more formal environment. A product of entrepreneurial parents, instilled a relentless love for business, and in 1982 she began her design firm, DOYEN DESIGNS in Kingston, Jamaica. The company, a full service design and advertising firm, specializing in architectural rendering and conceptual design, marketing and advertising relocated to Los Angeles, California and has been in the forefront of some of the most ingenious and innovative projects both on a national and international level. Now, in addition, D'Oyen is the founder and executive director of ArtSourced-Pros, a nonprofit organization dedicated to the development and enrichment of the arts while teaching kids responsibility of purpose as individuals and to be role models within their communities. As executive director, D'Oyen plays a key role in developing the organization's Back to Arts school program, which utilizes the skills of art professionals, write arts curricula, and sends artists into public schools to teach visual and performing arts with a goal of counteracting the rampant damage done by the dramatic reduction of funding for arts programs in California schools. ArtSourced-Pros also hosts, the multi-sensory, multi-cultural Art-Kids Depot Village which complements many major outdoor festivals throughout Southern California, reaching an estimated 550,000 kids, parents, teachers, volunteers, and event participants since its inception 8years ago. ArtSourced-Pros has been recognized as an Arts Organization trained in the Content Standards for the California Public School System. As such, it has achieved a "Professional Designation in Arts Education" by the LA County Arts Commission and The Pasadena Amory for the Arts. And, D'Oyen has been chosen the 2004 recipient of the prestigious John Anson Ford Human Relations Award for the Fifth Supervisorial District from the County of Los Angeles Commission on Human Relations for her tireless work and commitment to the community. She believes firmly in the organization's philosophy, that the education of the arts is one of the most powerful means of forging bonds between parents, schools, and communities, as well as building self-esteem and purpose for the next generation by helping to bring God's creativity back into their lives - one child at a time. Copyright © 2011 by Yolanda D'Oyen. All Rights Reserved. without expressed written permission from Yolanda D'Oyen.